The idea of Michael Jordan himself getting a reboot sends me into a state of silly giggly-ness. Do “the kids today” even know who the Tiny Toons are? Bugs and company were around forever on Saturday mornings, but I haven't seen TTA on TV since I don't know how long. Well, I'd watch it. I loved that show. I am firmly on board not just with Space Jam reboots, but also brand expansions into other sports the way Air Bud became an omni-athlete. So we need movies about Brett Favre or Tiger Woods or whoever getting THEIR grooves back too. It's sad how many early 90s animated series seem to have faded from public consciousness. A lot were licensed tie-in adaptations, but so was damn-near every 80s animated series. But I think their form of pop-culture savvy humour was an important bridge from the moralizing and black-and-white dialogues of 80s animated series and the whole post-Simpsons/Adult Swim/South Park/Seth McFarlane school of edgy, not-for-kids satire and dark comedy. 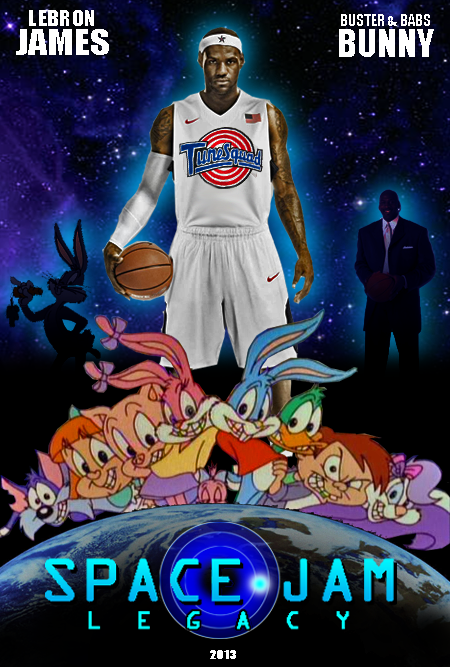 To be fair, Space Jam hasn't really aged all that well or at least does not quite gel with the classic Looney Toons material. It has that hypeactive, in-your-face kind of humor, that, perhaps ironically, Tiny Toons helped popularize. So if they made a Tiny Toons movie now, would it stay true to it's early 90s type of wackiness or sugar-infuse it to post-Spongebob levels? I would have liked to see it a few years ago with Shaq, but oh well… this would be okay too. Replace the Tiny Toons with the Animaniacs, and I'm sold. moviebob, do u watch the spacejam mashups?